I love corned beef and cabbage. It’s been part of my Irish family’s Saint Patrick’s Day traditions for as long as I can remember. I have lots of fun Saint Patrick’s Day memories. There is a local bar called The Park Hotel, that always hosts fun Saint Patty’s festivities. I have so many memories surrounding Saint Patrick’s day because part if the tradition includes listening to my grandfather entertaining the crowd playing his accordion. Because it is a bar, as a child I didn’t get to stay long, but cherish the memories I have of my mom running my siblings and I down there before things really got going to listen for a bit and occasionally even grab some dinner, which was corned beef and cabbage of course. The catch here is that while I love it, it’s never been one of my husband, or my kids favorite. I think it has to do with the chewy texture it so often has because last year I made it in my Instant Pot (IP) and everything changed. It was actually fork tender and delicious! If you don’t know what an IP is, it is an electric pressure cooker. I’ve been using mine for a little over a year now and I love it! It makes the best mashed potatoes, whole chickens (think fauxtisserie) one pot pasta dishes, and even cheesecake! I like mine so much because while it’s not fast food, it’s way faster than a slow cooker, and let’s be real here, some days, okay a lot of days, I just don’t have my act together quick enough to get dinner in the slow cooker. And after Jack’s encounter with the slow cooker I’m not as keen to leave it on while I am away as I used to be (insert sad emoji here). If you don’t have a pressure cooker, you can totally make this in the slow cooker. I have included the directions at the bottom of the recipe. Author: Jasey's Crazy Daisy ~ All images and content are copyright protected. Please do not use my images without prior permission. If you want to republish this recipe, please re-write the recipe in your own words, or simply link back to this post for the recipe. Thank you. View complete copyright policy for more details. Place trivet in bottom of Instant Pot, Add beet broth, water, bouillon if desired, seasoning packet, onion, garlic, and peppercorns to pot. Add corned beef fat side up. Make sure the silicone ring is in place and twist the lid on the pot locking it into place. Turn the sealing lever so that the pot is sealed. Press "Manual" and use the "+" sign to set the cooking time to 80 minutes. The display will show "ON" while the pot comes to pressure which will take about 15 minutes. When it comes to pressure the display will show "80" and begin counting down. It will beep to signal it has finished cooking. At this point you can use natural pressure release (NPR), this means you wait patiently for the pressure to release, you can tell when the float drops on it's own which will probably by about 15 minutes or use quick release (QR), which means you turn the sealing lever to vent to let the pressure escape. Be careful because the steam is hot. When the pressure has released, remove the lid. Place the corned beef on a plate covering with foil to keep warm and set aside. If your corned beef is bigger, you made need more cooking time. If it's not as tender as you'd like after 80 minutes, repeat the cooking directions for another 10-15 minutes. Leaving trivet in the pot, put the veggies in this order into the pot: potatoes, carrots, onions, garlic, cabbage. Replace lid following the same process as described above. Using the "Manual" high pressure setting and cook the veggies for 3 minutes for more tender crisp results or 5 minutes for softer results. Use the quick release method. When the float drops remove the lid, use a slotted spoon to remove vegetables from pot and serve with sliced corned beef. Enjoy! ***If you live at high altitude like I do, you may have to increase your cooking time. Click here to learn more. I usually increase my recommended cooking times by about 205. Place everything except cabbage in a large slow cooker. Set to high and cook for 5-6 hours. Add cabbage to the top and cook for another hour, or until done. Remove from liquid, and serve. 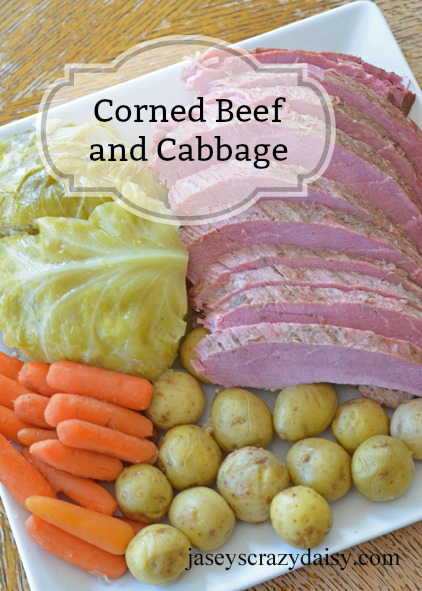 If you loved this Instant Pot Corned Beef & Cabbage please give this recipe a star review! Also, be sure to snap a picture of your finished dish and share it with me on Instagram using the hashtag #jaseyscrazydaisy and tagging me @jaseyscrazydaisy. Thanks for being social!